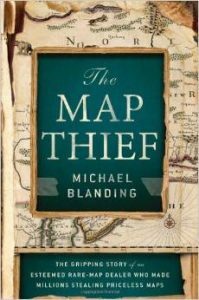 The Map Thief: The Gripping Story of an Esteemed Rare-Map Dealer Who Made Millions Stealing Priceless Maps. First edition. New York: Gotham Books, 2014. 300p. $27.50. This book is part true crime, part history lesson and part biography. It will appeal to map enthusiasts and geography buffs, map and book dealers, librarians, and many others. The first half of the book is mostly a history of early cartography of the Western Hemisphere, which will be especially appreciated by map history aficionados and the academically inclined. It is at times a bit disjointed as the author attempts to interweave the historical tales with the Smiley affair, repeating himself in order to bring the reader back to the present era. Eventually he hits his stride, however, and it is a satisfying read to be sure. It includes more than 30 illustrations of rare maps, including several color plates. The Map Thief is the story of E. Forbes Smiley III, who until his fall was a respected dealer in antiquarian maps of America. Born in Martha’s Vineyard, he returned there later in life in a continued attempt to project a cultured and moneyed persona. Over the course of only five or ten years, he established himself as a world-class authority on rare mapping of the settling of North America, largely through personal research. He built relationships with map librarians and eventually began to donate rare maps to their collections. These acts were self-serving, however, as they helped him achieve the image of a philanthropist and cemented the relationships that brought him more sales. But more importantly to the story, they ingratiated him with the curators and library heads, bringing him a level of trust that allowed him even greater access to the maps that he could then steal. The author raises the question of how a sophisticated purveyor of cultural goods at the top of his game could stoop so low as to deface the very precious items that he loved and which represented his livelihood, even his identity. While Blanding does not explicitly answer this question, he does answer it implicitly in the narrative. Aside from the obvious answers of greed and poor financial management (both clear from the book), one can see that Smiley’s initial foray into theft was a crime of opportunity. His nearly unfettered access to the highly valuable and easily stolen artifacts represented an irresistible temptation to him. As to how he could bring himself to deface 400-year-old atlases, the answer is simple: he was accustomed to doing so as a business practice. Antiquarian map dealers had been doing it for years with legally purchased tomes. Many more map collectors could afford just one map than an entire atlas, so dealers would remove the maps from their binding and sell them off piecemeal. Multiple sales could be realized quickly, recouping a dealer’s investment (and increasing the profit). Another justification was that maps were meant to be used, and this practice put the maps into the hands of many more people. The book sheds light on several systemic weaknesses that made such thefts possible, such as a lack of provenance for maps in the rare map trade, and incomplete cataloging of atlases and other map materials in libraries. Numerous other factors are documented. Some libraries have already taken significant measures to correct known deficiencies. Perhaps more libraries and also dealers and collectors will follow suit. The book’s appendices include a full list of the maps that Smiley admitted to stealing–many of which have never been claimed. It is quite possible that this book, by bringing the Smiley affair back into the limelight, will actually help more of these maps to find their way home to their rightful owners. The author has written a well-researched piece of investigative journalism, simultaneously educating the reader on the history of the stolen maps. As the seminal work exposing the story of the most damaging map thief in history, it will no doubt quickly become an important reference for map librarians, collectors and dealers. The Map Thief will be a worthy addition to every map library. It is an important contribution to the body of knowledge of map librarianship in particular, and should be required reading in classes on map librarianship. It will be equally beneficial to the staff of any library that houses rare books. The information included in it will be invaluable to library staff as they seek to preserve their own collections; and it will fascinate them as their own colleagues appear as prominent figures in the story. Researchers in cartography and related fields will find the book interesting not only for the abovementioned facets of the work, but for the intrigue surrounding the story, which will make it a compelling source for various theses.